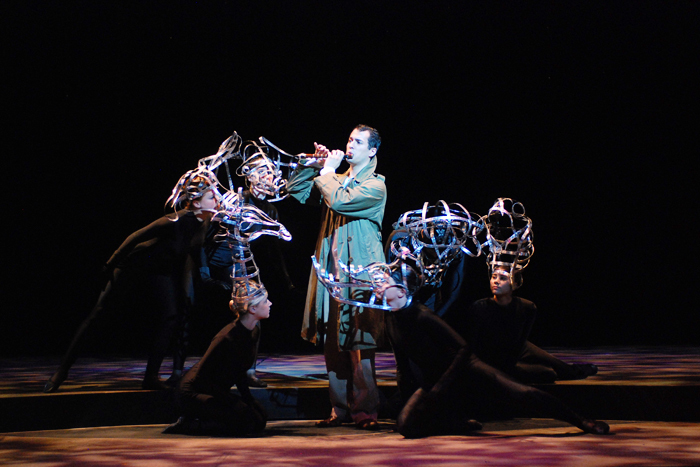 Tamino plays in the University of Illinois 2011 production of Mozart's "The Magic Flute," directed by Eduardo Diazmuñoz. CHAMPAIGN, Ill. - Internationally renowned opera singer Nathan Gunn has been named general director of the University of Illinois' new Lyric Theatre program, which - like Gunn - will embrace a broad spectrum of vocal theater repertoire, from musicals to opera. "Creating a title that best suited the job at hand was no easy feat, but I like the ring of it," said Gunn, who is a U. of I. alumnus and voice professor. "I'll be responsible for the artistic direction and fiscal integrity of the program. "This program will combine the strengths of the School of Music, and the departments of theater and of dance at Illinois, enhancing the education of undergraduates and better preparing our graduate students for the professional world. The fundamentals of singing, dancing and acting are more necessary than ever to be competitive in the world of musical theater, operetta and opera, and that is what we intend to give them at Lyric Theatre at Illinois." Jeffrey Magee, the head of the School of Music at Illinois, said Lyric Theatre will regularly engage guest stage directors, conductors, performers and composers, with the goal of providing students with not only the tools but also the connections they need to pursue performance careers. "This will be comprehensive training for the singing actor," Magee said. "Nathan's leadership symbolizes that link between the university and the top shelf of the professional world, because he lives in both worlds. We're hoping the networks that form through this program can help us carve a path for students once they graduate." Gunn's personal performance schedule for the next few months includes touring Australia with Mandy Patinkin in November, performing the role of Papageno in "The Magic Flute" with the Metropolitan Opera in December and January, and starring as Figaro in "The Barber of Seville" with the Lyric Opera of Chicago in February. But that doesn't mean he's absent from the U. of I. "He's been with us on the phone, email and Skype quite a bit lately," Magee said. Other Lyric Theatre faculty members: voice professor Jerold Siena as artistic administrator, and accompanying professor Julie Jordan Gunn as director of Lyric Theatre studies. Siena, a tenor, has appeared regularly with the Metropolitan Opera and other prestigious opera companies, and has directed operatic productions for Arizona Opera, Florida Presbyterian College and Yale University. Julie Gunn - a pianist, music director, vocal coach and song arranger - has served on the music staff at the Metropolitan Opera's young artist program, Wolf Trap Opera, St. Louis Opera Theatre and many others. She is the assistant director for development and public engagement in the School of Music. Tom Mitchell and Rebecca Nettl-Fiol will serve as liaisons with the theater and dance divisions, respectively. Lyric Theatre will take the place of the opera program that has been under the leadership of artistic director Eduardo Diazmuñoz for the past decade. Diazmuñoz has accepted the position of music director of the Conservatorium Orchestra and professor of conducting at the Sydney Conservatorium of Music in Australia. In his announcement of the creation of Lyric Theatre, Magee acknowledged Diazmuñoz's contributions to Illinois. "We extend profound thanks for his extraordinary service to the University of Illinois," Magee said. A farewell party for Diazmuñoz will take place following one of the November performances of "Falstaff" at Krannert Center for the Performing Arts. To contact Jeffrey Magee, email jmag@illinois.edu.